This collection is based on the premise that apocalyptic imagery and themes pervade not only cultural products that employ specifically biblical imagery but are also found in media that do not purport to impart biblical or even religious messages. Comic books and graphic novels are the focus here because, it is suggested, they are the medium that comes the closest to the imaginative malleability found in the history of biblical interpretation. In Part One, the focus is on Indie/Creator-owned works. Emily Laycock demonstrates the overwhelming influence of Herbert W. Armstrong and his apocalyptic Worldwide Church of God on Basil Wolverton’s work, especially his biblical art. Aaron Kashtan then introduces us to Kevin Huizenga’s short ‘Jeepers Jacobs’, in which the title character—a theologian whose main area of research is the Christian doctrine of Hell—tries to convert an acquaintance with odd and fatal results. In her chapter, Diana Green examines Alan Moore’s Promethea, a character whose purpose is to initiate an Apocalypse but whose journey is much more complicated. Finally, A. David Lewis engages humorous and profane examples of apocalyptic imagery in the recent Indie comics Battle Pope and The Chronicles of Wormwood. Part Two examines more mainstream works and begins with Terry Ray Clark’s adroit examination of how Kingdom Come utilizes both the functions and forms of ancient apocalyptic literature. Greg Stevenson then analyses a variety of texts—including X-Men: The Age of Apocalypse and issues 666 of Superman and Batman—to discern the way(s) in which the mythological language of apocalyptic and the mythology of superheroes interact. And finally, Greg Garrett provides a broad and thoughtful rumination on the two most widely read mainstream comics that deal with the End of Days: Kingdom Come and Watchmen. 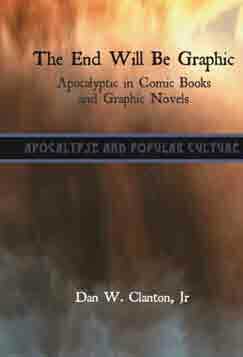 This is the fifth volume in the series Apocalypse and Popular Culture; see also (1) Walliss and Quinby, Reel Revelations, (2) Gribben and Sweetnam, Left Behind and the Evangelical Imagination, (3) Howard, Network Apocalypse, (4) Partridge, Anthems of Apocalypse, and (6) Aston and Walliss, Small Screen Revelations. Dan W. Clanton, Jr, is Assistant Professor of Religion at Doane College, Crete, Nebraska.